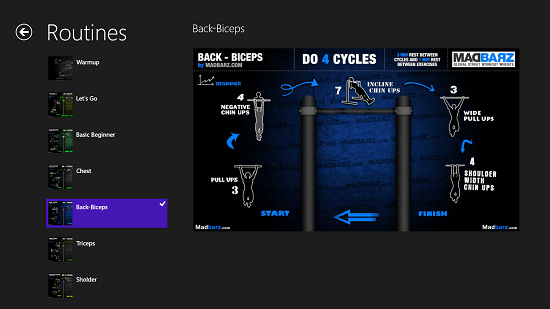 MadBarz is a free fitness app for Windows 8 and 8.1 which allows you to stay in shape. The app provides you with a large database of exercises via the flowchart method which is easy to follow and makes for a great way to challenge your mind, body and soul to achieve the ultimate physique of your dreams. The app is lightweight, and is available freely from the Windows App Store. Another great feature of the app is that it also provides diet plans that fitness professionals follow themselves. The app is completely ad free and supports both touch and non touch devices. 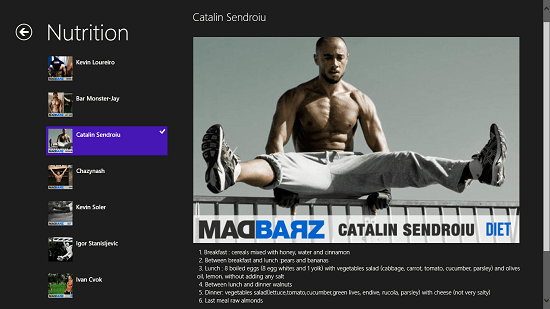 MadBarz is available for free from the Windows App Store. When you run the app, you will be presented with a screen as shown below. You can click on any particular routine in the screenshot above from the three routines shown – Beginner, Medium and Hard. When you click on any particular routine from the above shown tiles, you will be brought to an interface which looks like the below screenshot. As you can see, you will be presented with the routine type on the left pane and when you click on any particular routine type, you will be able to watch its flowchart on the right side of the screen. Similarly in the app’s main screen, you can also choose to view the Nutrition section and in the same way as the routine section, you can click on the fitness professional’s name on the left side of the screen, and what follows is the photo of that professional at the right side of the screen with the nutrition that he follows himself. You can use this nutrition to your own advantage. This basically wraps the main features of the MadBarz app for Windows 8 and 8.1. In a nutshell, this is a great app to stay in shape and get fit which doesn’t suffer from annoyances like ads etc. MadBarz makes for a great fitness app which you can download and have on your device for free from the link below.